Napa here we come, pack a bag for an overnight trip. Although Napa is not far from where most of the weekend winos live, a few of us decided to spend the night which requires a little more planning than the usual weekend adventures. First we picked where we would go tasting and everything else (hotel, restaurants, etc.) followed. Interestingly, there was an art element to each of the winery picks. PEJU in Rutherford: The Peju Winery Art Gallery had just rotated their exhibit to An Artful Pairing with The Christopher Hill Gallery (through April 23, 2014). We went to Peju specifically for the Cabernet Franc and it was as good as we remembered or better. To our surprise, the less expensive wines we tasted were also excellent. Provence, a red and white blend, is light yet complex and surprisingly good. 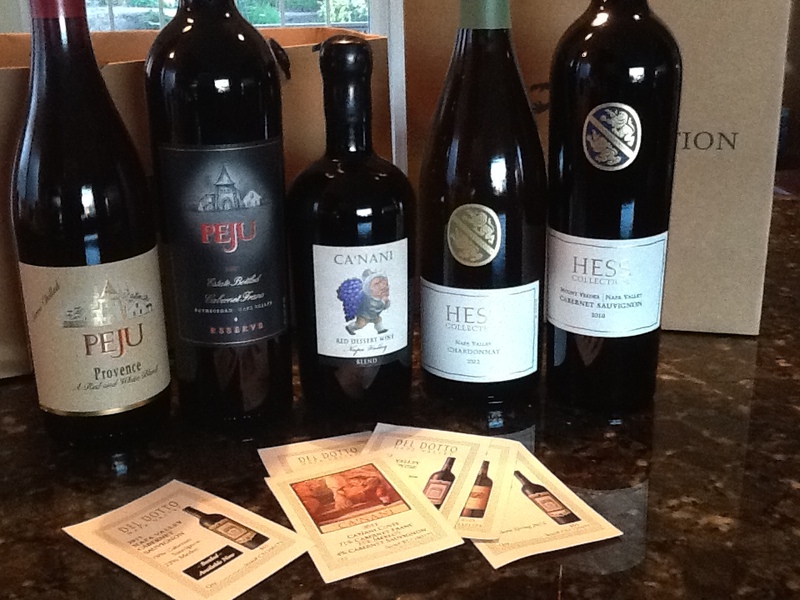 One of the winos was so impressed by all the wines, she joined the Peju Club. Del Dotto Estate Winery and Cave in St.Helena: We were immediately transported to Italy via the architecture, music and the barrel tasting. Our host was very well informed and tasting the difference between a Cabernet Sauvignon from French and American oak barrels side-by-side, straight out of the barrels was a great experience. The Ca’Nani label made us all smile. Ca’Nani translates from Italian meaning “House of the Dwarves”, it comes from a Venetian fairy tale from the Grimm brothers in the late 1800’s. The port with dark chocolate, that we enjoyed after some pizza and prosciutto made on site, was a favorite for most of us. The Hess Collection Winery and Art Museum: This was our last stop and in my personal opinion, the art gallery was just as impressive as the wines we tasted. From 16 different options ranging from Gewurtztraminer to Malbec, the 2012 Napa Valley Chardonnay and the 2010 Mount Veeder Cabernet Sauvignon were clear winners for all the winos. At Hess they “support responsible hospitality” just like our group “supports responsible drinking”. We stayed at the Napa Valley Lodge in Yountville which had been recommended by many in the group. The rooms, staff, complimentary wine tasting Friday afternoon and breakfast in the morning made us feel right at home (no better compliment than that for a hotel). After dinner we returned to the room to find the perfect saying on our pillows: Wine is one of the agreeable and essential ingredients of life – Julia Child. Categories: Travel, Wine | Tags: Ca'nani, Cabernet Sauvignon, Chardonnay, Dell Dotto, Hess Collection, Napa, Napa Valley Lodge, Peju Winery, port, wine | Permalink.